Never Let Me Down: USA; EMI America, 4V-19255; 1987. Card slip-case with all-round picture panels in long box. Track list on rear of cassette box and rear of long box. ‘CMS’ (cassette maxi-single) on front and sides and tabs of long box and EMI America on rear and ‘Manufactured in the USA by Capitol Records Inc’. 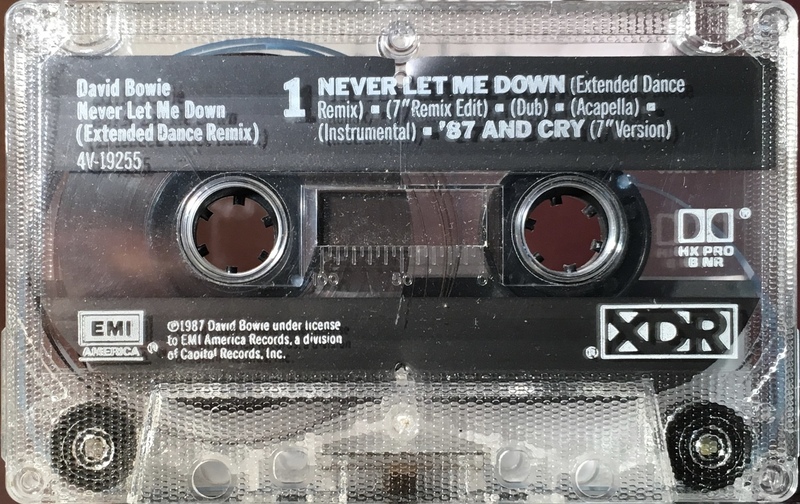 The cassingle slip case has ‘Manufactured in the USA by Capitol Records Inc’, ‘CMS’ (cassette maxi-single) on the rear and Never Let Me Down (Extended Dance Mix) only on the sides. Additional credits shown on the rear panel: additional synthesisers; Spencer Bernard; additional keyboards; Steve Hodge; alto sax; David Eiland. ‘XDR’ not shown on slip case or long box. The timings for the tracks are: Never Let Me Down (Extended Dance Mix)(7:03); Never Let Me Down (7″ remix edit)(3:58); Never Let Me Down (Dub Mix)(3:57); Never Let Me Down (Acapella Mix)(2:03); Never Let Me Down (instrumental)(4:02); ’87 And Cry (7″version)(3:53). These are the same versions in sequences the Japanese CD Single CP20-5520; there is no discernible break between the ‘dub’ and ‘a capella’ versions..
White ink printed directly to clear patterned shell. ‘EMI America’, ‘XDR’ and ‘Dolby HX Pro’ logos on shell, light blue lead in tape. 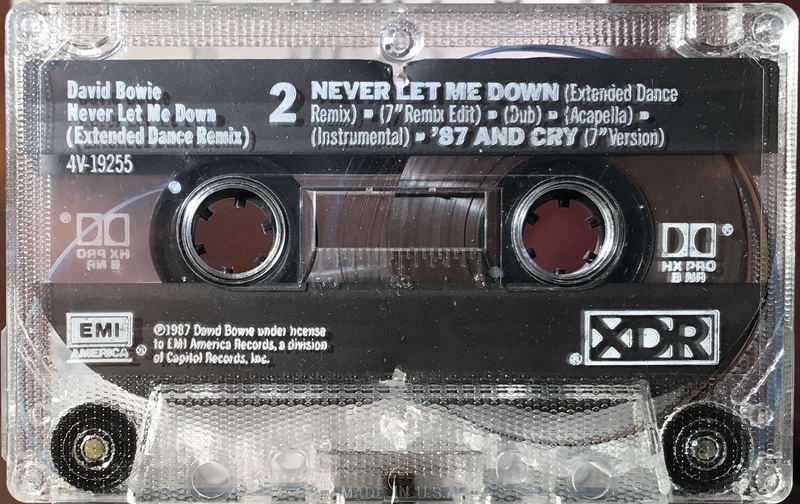 Side 1: Never Let Me Down (Extended Dance Mix); Never Let Me Down (7″ remix edit); Never Let Me Down (Dub Mix); Never Let Me Down (Acapella Mix); Never Let Me Down (instrumental); ’87 And Cry (7″version).